US, 1966, 105 minutes, Colour. Gregory Peck, Sophia Loren, Alan Badel, Kieron Moore, John Merivale, Duncan Lamont, George Coulouris, Ernest Clark. Arabesque is pleasant light entertainment in the thriller vein. Director Stanley Donen had made a number of musicals, especially On the Town and Singin’ in the Rain with Gene Kelly. He also directed such musicals as Funny Face. During his career he also directed a number of light comedies but during the 1960s made both Charade and Arabesque, light thrillers, Charade with Audrey Hepburn and Cary Grant, Arabesque with Sophia Loren and Gregory Peck. Gregory Peck plays a rather ivory tower bumbling professor of Arabic literature. He is asked to become involved to stop a plot against the prime minister. This means infiltrating an organisation in the Middle East, presided over by Alan Badel, with Sophia Loren playing his mistress. There are various twists and turns as might be expected in an arabesque. Ultimately, the plot is thwarted and there is a romance between Peck and Loren. 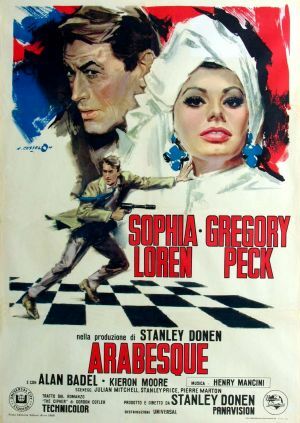 The film relies on Gregory Peck’s sturdiness, Loren’s beauty and charm, and Donen’s enthusiastic pacing. The film has a Henry Mancini score. 1. A good thriller? Why? What were its best features, most successful features? 2. The significance of the name, with Arabs, the colours and music of the film? especially the credits? 3. Was this film real? Was it quite unreal? Does this kind of thing happen? 4. Was the mystery effective? Or was it too complex? Was it a well worked out mystery? 5. David Pollock as a person, was Gregory Peck credible in his role? The scholar, as a spy, as quick-witted, in his violence? In his loyalties to the Arabs? Was he a hero? 6. Yasmin as a heroine? Was Sophia Loren convincing as a person, as a spy? Her love for David, her revulsion for the villain? 7. The villains: were they convincing or caricatures of evil? 8. Comment on the use of such situations as the academic scene, the chase in the zoo, the races, the warehouses, for effectiveness of the film? 9. Was the assassination attempt and all that went with it removed from reality or did this seem plausible? 10. Why are films like this so popular? Do they entertain well? What value have they besides entertainment? Should they have value besides entertainment?